Over the past three years Latin American leftist leaders, who presided over heterodox ‘free trade’ and commodity based welfare economies, lost presidential, legislative and municipal elections and referendums or faced impeachment. They fell because they lost competitive elections, not because of US invasions or military coups. These same leftist leaders, who had successfully defeated coups and withstood gross US political intervention via AID, NED, the DEA and other US government agencies, lost at the ballot box. What accounts for the changing capacity of leftist presidents to retain majoritarian electoral support over almost a decade? Why did the US-backed and funded candidates win this time, when they had been defeated in several previous elections? What accounts for the defeat of the rightist violent road to power and their subsequent victory via the electoral process? The electoral victories of the Left were preceded by a deep crisis in the ‘free market’ and deregulated economies, which were accompanied by intense class struggle from below. Class struggle polarized and radicalized vast sections of the working and middle classes. In Argentina, the total collapse of the financial and manufacturing system led to a popular uprising and the rapid overthrow of three presidents. In Bolivia, two popular uprisings overthrew two US backed ‘free market’ presidents. In Ecuador, a popular ‘citizen movement’ ousted a US-backed president. In Brazil, Paraguay and Venezuela, burgeoning peasant and urban movements, engaged in direct action and in opposition to their ‘free market’ presidents, resulted in the election of left presidents. Four inter-connected factors came to the fore to explain the left’s rise to power: First, the dramatic collapse and ensuing socio-economic crisis, entailing poverty, stagnation and repression by rightwing regimes, precipitated a large-scale shift to the left. Secondly, the intense class struggle, responding to the crisis, politicized the workers, radicalized the downwardly mobile middle classes and eroded the influence of the ruling class and the impact of their elite-controlled mass media. Thirdly, the leftist presidents promised long-term large-scale structural changes and successfully implemented immediate social impact programs (employment, social benefits, bank deposit protection, pay raises and large scale public investments). Last, but not least, the leftist presidents came to power at the beginning of or during a mega-cycle commodity boom providing multi-billion dollar surpluses in export earnings and tax revenues with which to finance new inclusionary social programs. During the first years of the left governments, they kept the heat on the rightwing elites: defeating abortive coups, expelling intrusive US Ambassadors and US agencies and defeating the local US clients. They moved on the legal front to consolidate political power by convoking constitutional assemblies to approve progressive constitutions. They attracted and built on the support from their new indigenous, popular and middle class constituents. The constitutional changes reorganized new social alignments, especially the rights of indigenous people, but fell far short of serving as the basis for a change of property relations. The left governments reinforced their dependence on agro-mineral exports by designing a growth strategy based on economic partnership with multi-nationals and agro-business plantation owners. The rising prices of commodities on the world market led to increases in government revenues, public investment in infrastructure and expanded employment in the public sector. The left governments constructed large-scale patronage systems and clientelistic electoral machines, which ‘mobilized’ the masses on electoral and ceremonial occasions and for international forums. International left academics and journalists were impressed by the left administrations’ fiery rhetoric supporting anti-imperialist, anti-neoliberal policies. Local and overseas pundits parroted the rhetoric about new forms of ‘socialism’, 21st century socialism in Ecuador and Venezuela and Andean socialism in Bolivia. In actual practice long-term, large-scale contracts were signed with international giants like, Repsol, Monsanto, Jindel and scores of other imperial backed multi-nationals. Big agro-exporters received credits, loans and technical aid while peasants and local producers received only the paper ‘land titles’ for their small holdings. No large-scale land distributions were undertaken. Landless peasants, who were engaged in land occupations, were forcibly evicted. Increased government spending on credit and technical assistance was channeled almost exclusively to large-scale soya, cattle, cotton and other agro-exporters, which increased rural class inequalities and exacerbated the decline of food security. During the decade, militants became functionaries, who developed ties with business groups and began their own process of ‘social mobility’. The agro-mineral export model raised incomes and reduced poverty but also accentuated inequalities between government functionaries and peasants and urban workers. The newly affluent, upwardly mobile middle class no longer flocked to hear ‘egalitarian rhetoric’. They sought security, pursued credit-financed consumerism and looked upward toward the wealthy elite for their role models and life style changes – rather than expressing solidarity with those left behind. The leaders’ anti-imperialist rhetoric was increasingly discounted by most people as it was contrasted with the large-scale inflow of capital and the contracts with multi-nationals. The symbolic ‘gestures’ and local projects celebrated before large crowds were accepted but increasingly failed to compensate for the daily routines of centralized power and local corruption. Over the decade the political cadres of the left governments rounded-up votes via electoral patronage favors, financed by bribes from contractors and illicit transfers of public funds. Re-election bred complacency, arrogance and a sense of impunity. The perquisites of office were taken for granted by party leader but were perceived as unwarranted privileges by many working class and peasant voters. The de-radicalization process at the top and middle levels of the left regimes led the lower classes to rely on individualistic, family and local solutions to their everyday problems. With the demise of the commodity cycle, the broad coalition of workers, peasants, middle class and professional groups splintered. Many rejected the malfeasance of the left regimes as a betrayal of the promise of change. Thus the popular sectors embraced the moralizing critique mounted by the right. The retrograde radical right exploited discontent with the incumbents and played down or disguised their plans to reverse and undermine the employment and salary gains, pensions and family allowance gained over the decade. The left governments stimulated the growth of extractive capitalism and converted their mass base into a passive recipient of regime reforms. The unequal power between leaders and followers was tolerated as long as the incremental rewards continued to flow. As classes rose in the social hierarchy they shed their leftist ideology born of crisis and looked to elite politicians as the new ‘modernizers’. The left regimes encouraged a ‘dependency culture’ in which they competed for votes on the bases of growth, markets and patronage. The left functionaries, unable to rise via the ‘closed’ agro-mineral sectors – under the control of the multi-nationals, turned to state corruption, extracting ‘commissions’ as intermediaries for the MNC, or simply absconding with public funds allocated for municipal health, education and infrastructure projects. As a result, electoral promises were not kept. The corrupt practices were ignored by their elected leaders, deeply offending the popular electorate, who were disgusted by the spectacle of corrupt left politicians applauding radical rhetoric while raiding federal funds with impunity. Party loyalty undermined any national political oversight of local politicians and functionaries. Disenchantment with the local functionaries spread up to the top. Popular leaders, who were repeatedly elected soon, were implicated or at least complicit in bribe-taking. The end of the decade and the end of the commodity boom marked the twilight of idols. The left lost elections throughout the region. The Kirchner-Fernandez regime was defeated in Argentina (2015). The Lula-Rousseff regime faces indictment and impeachment in Brazil (2014-2016). The Chavez-Maduro regime lost the legislative election in Venezuela (2015). 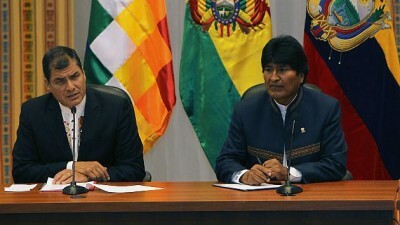 The Evo Morales regime lost the constitutional amendment allowing the president’s third term re-election in Bolivia (2016).